With the QUIQQER PAYMILL payment module, you enable your customers to pay for orders with their credit card. 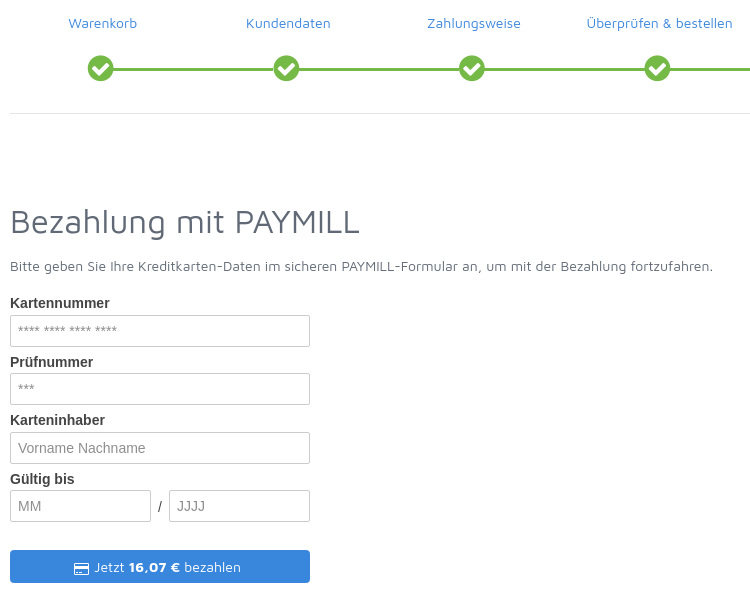 The processing of the payments takes place via PAYMILL. Your customers enter their credit card details in a secure PAYMILL form, where they are also reviewed and validated. If the data is correct, the order can be paid with a simple click. Everything else happens in the background. Your QUIQQER Store installation does not handle sensitive credit card information. Credit card details are sent exclusively to PAYMILL. IMPORTANT: Requires a PAYMILL Merchant Account! You can read about how to configure everything at https://dev.quiqqer.com/quiqqer/payment-paymill/wikis/api-configuration.